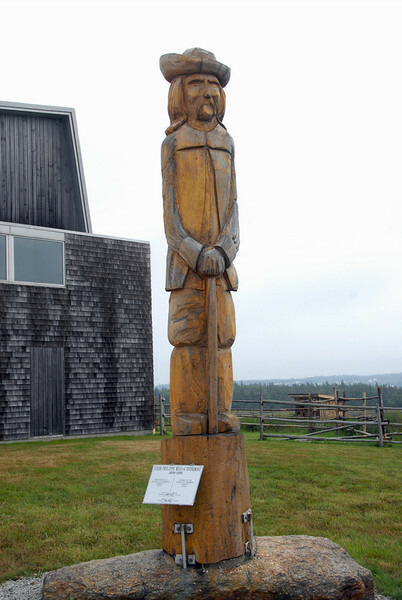 This statue is located in the historic Acadian village of West Pubnico, Nova Scotia. Philippe owned and ruled all of Pubnico Nova Scotia during the last half of the 1600s. Philippe was a baron of Cherbourg, Normandy France who was enticed in the 1640s with a barony (that's land and titles) in Acadia, mainly Nova Scotia, by King Louis XIV's governor of Acadia. According to the Dictionary of Canadian Biography Philippe's wife Madeleine Helie du Tillet was related to the Royal Bourbon family, which during her lifetime included Louis XIII and Louis XIV. Philippe and Madeleine had a daughter Marie Marguerite Mius d'Entremont. Marie married Pierre Melanson (who was a noble lord in Acadia in his own right). Pierre and Marie's third great granddaughter Euphrasie Melanson was the mother of our great great grandfather J. Damonville Bernard, Agatha's father.